Maps of NSW, including the Blue Mountains, Central Coast, Hunter Valley, South Coast, Snowy Mountains and the Northern Rivers NSW. The Northern Rivers of New South Wales form the North East coast corner of the state. Another popular stopoff point, like the North Coast for those travelling the Sydney to Brisbane route. New South Wales covers an area with terrain varying from desert to snow capped mountains, vast plains and beautiful coastline. If you get the chance to tour the South East of Australia, try to stop at some of the wonderful National Parks along the way. 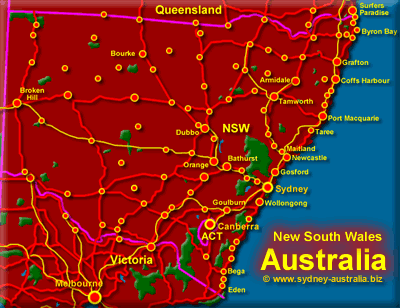 The major routes from Brisbane to Sydney, Melbourne to Canberra to Sydney and Adelaide to Brisbane in Queensland are shown. New South Wales Accommodation - Sydney City and Beach Hotels.